So the whole family is watching the Super Bowl or their favorite team on TV. And the only conversation is folks yelling at the television or dissing the sportscasters. But you want to join in … So ...duh! Just do it ... with Fat Cat Sports Chat. Whether you want to cheer the team on or bemoan their fate, Fat Cat Sports Chat is major league. A fun app that's real assistive technology. 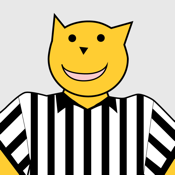 Fat Cat Sports Chat uses a real voice to provide 160 phrases. Start a conversation or keep one going -- with quick "take a seat"s and rousing call-outs. Great for texting or talking, Fat Cat Sports Chat is based on principles of phatic communications, and geared to the casual TV conversation of sports fanatics. Unique interface -- patent pending. You need it -- and you know it. Only $.99, and there's nothing like it. Integrates with your e-mail, Twitter, instant messaging, and texting. You can also connect to other Fat Cat Chat apps, and pass text among them. For more info, visit Fat Cat Sports Chat online.